Here at Frain Industries, Inc. we keep your production goals in mind which is why we are a turnkey supplier that will quickly deliver your products and assist you with the installation. We extensively test our stainless steel water tanks which results in high levels of customer satisfaction. If you would like more information about our stainless steel water tanks then please give one of our representatives a call today! G & F Manufacturing Company is a leading manufacturer of stainless steel products. 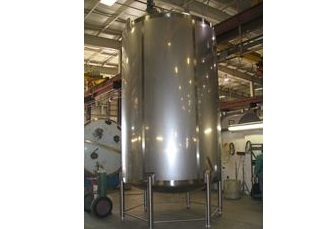 We specialize in stainless steel water tanks and we can meet your needs. We offer high-precision processing and engineering to great the most durable stainless steel water tanks available. Our state-of-the-art techniques ensure our customers’ satisfaction and it is our mission to maintain honesty in everything we do. We look forward to providing you the best solutions. What was once a small, two-man job shop, Springs Fabrication is now home to nearly 150 employees operating in over 100,000 square feet of industry leading high bay manufacturing facilities. From the capabilities to manufacture custom designed stainless steel water tanks to fully engineered systems, Springs Fabrication is one of the country’s premier manufacturers. A&B Process Systems is a premier designer, engineer & fabricator of not only stainless steel tanks, but also stainless steel pressure vessels, stainless steel process systems & stainless steel water tanks. We provide manufacturers in the pharmaceutical/personal care, bio-tech, food/beverage, dairy & renewable energy/industrial markets with solutions for basic to complex steel tank problems. Stainless steel water tanks are used for the storage of water for a range of purposes from drinking water, fire protection, agricultural and immigration use, municipal use, food preparation to waste water storage. While typically designed to hold large supplies of water and commonly found with volume capacities of thousands of gallons, water tanks can also be designed to hold much smaller amounts depending on their application. Stainless steel is an ideal material choice for tank construction for a number of reasons. It is a relatively low cost and durable material, and so is used to manufacture large SS tanks which are able to withstand the pressure of high volumes of water. The corrosion resistance of stainless steel is an essential feature of water tanks considering the potential for contamination of drinking water or food preparation water. Water tanks can also be attached to vehicles to provide transportation of water to areas which may not have a suitable water source. These trucks and trailers use horizontal cylindrical stainless tanks, relying on the low profile nature of the cylinder to provide a steady equilibrium for moving large volumes of water. These stainless water tanks can be found above ground or underground, and while are typically found outdoors, can also be installed in an indoor location. Basic design and material choice are important elements of manufacturing. Further specifications of stainless steel storage tank design to consider include size, use of the water to be stored, the required temperature for storage, especially in outdoor applications with harsher climates, desired pressure for water removal from tank and how it is to be removed. Water tanks are connected to pumps and plumbing systems that are responsible for bringing the water in and taking it out. To maintain appropriate tank pressure, inlet and outlet valves should be used to prevent backflow and possible contamination of the existing water supply. Other factors to consider include the potability of the water itself and whether it needs chemical processing prior to or after storage. Extra steps can be taken to provide this if necessary. Either way, the tanks must be inspected and the water tested regularly to ensure that the water being supplied from the tanks is suitable for its application in terms of cleanliness and neutrality. Water is susceptible to bacteria, viruses, algae and mineral accumulation and therefore needs to be carefully observed, especially for drinking water or food processing and chemical processing uses.